The TOGGLER SNAPTOGGLE BE toggle anchor provides a secure hold from within various hollow materials 3/8" to 2-1/2" thick including gypsum board, drywall, and concrete block, and is made in USA. The anchor requires a 5/16"-18 UNC-threaded metal bolt with a minimum length equal to the thickness of the item being fastened and the thickness of the mounting material plus 1/2". The anchor channel will not rotate when installing the bolt, whether installing by hand or with a screw gun, and will stay in place if the bolt is removed to facilitate fixture and screw changes. The SNAPTOGGLE anchor meets Federal Specification FF-B-588-D for Type V anchors. The anchor consists of a corrosion-resistant zinc-plated steel anchor channel that inserts through a 3/4" drilled hole in walls, ceilings, or floors and installs against the back side of the mounting material; plastic straps attached to the channel that position it into place; and a plastic cap that slides down the straps and presses into the drilled hole firmly to lock the anchor channel in place behind the mounting material. Once the cap is set in place, the straps snap off by hand. The item being fastened affixes to the mounting material by inserting a bolt through the item, into the drilled hole, and through the anchoring channel behind the material and tightening. Media Drill Diameter Bolt Description Ultimate Tensile Strength Ultimate Shear Strength 1/2" Drywall 3/4" 5/16"-18 UNC zinc-plated steel 270 lb. Not available 5/8" Drywall 3/4" 5/16"-18 UNC zinc-plated steel 480 lb. Not available 1/2" Drywall with 25 Gauge Stud* 3/4" 5/16"-18 UNC zinc-plated steel 439 lb. Not available 5/8" Drywall with 25 Gauge Stud* 3/4" 5/16"-18 UNC zinc-plated steel 477 lb. Not available Concrete Block 3/4" 5/16"-18 UNC zinc-plated steel 1,400 lb. Not available *Failure measured as breakage of drywall portion. Warning: Use one-fourth or less of listed maximum values for safe working loads (as required by local regulations). For more information, see the manufacturer's technical bulletin. Anchors provide reinforcement to a fastener that would otherwise have insufficient hold in substrates such as concrete, brick, stone, drywall, or other materials for a particular application. The fastener may be included with or integrated into the anchor itself, or it may be sold separately. Anchors provide support through various methods, including expansion from within or behind the substrate or even adhesive compounds. TOGGLER Anchor System manufactures wall anchors and toggle bolts. The company, founded in 1968, is headquartered in Norwalk, CT. Brand: TOGGLER | Manufacturer: Mechanical Plastics Corp. 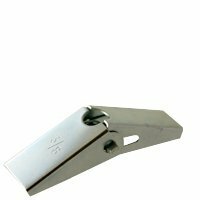 The TOGGLER SNAPTOGGLE BD toggle anchor provides a secure hold from within various hollow materials 3/8" to 2-1/2" thick including gypsum board, drywall, and concrete block, and is made in USA. The anchor requires a 1/2"-13 UNC-threaded metal bolt with a minimum length equal to the thickness of the item being fastened and the thickness of the mounting material plus 1/2". The anchor channel will not rotate when installing the bolt, whether installing by hand or with a screw gun, and will stay in place if the bolt is removed to facilitate fixture and screw changes. The SNAPTOGGLE anchor meets Federal Specification FF-B-588-D for Type V anchors. 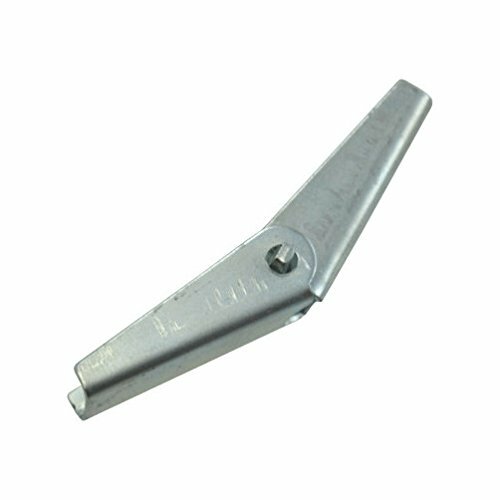 Media Drill Diameter Bolt Description Ultimate Tensile Strength Ultimate Shear Strength 1/2" Drywall 3/4" 1/2"-13 UNC zinc-plated steel 275 lb. Not available 5/8" Drywall 3/4" 1/2"-13 UNC zinc-plated steel 576 lb. Not available 1/2" Drywall with 25 Gauge Stud* 3/4" 1/2"-13 UNC zinc-plated steel 468 lb. Not available 5/8" Drywall with 25 Gauge Stud* 3/4" 1/2"-13 UNC zinc-plated steel 513 lb. Not available Concrete Block 3/4" 1/2"-13 UNC hardened zinc-plated steel 2,038 lb. (failure of block) Not available *Failure measured as breakage of drywall portion. The TOGGLER SNAPTOGGLE BA toggle anchor provides a secure hold from within various hollow materials 3/8" to 3-5/8" thick including gypsum board, drywall, and concrete block, and is made in USA. The anchor requires a 3/16"-24 UNC-threaded metal bolt with a minimum length equal to the thickness of the item being fastened and the thickness of the mounting material plus 1/2". The anchor channel will not rotate when installing the bolt, whether installing by hand or with a screw gun, and will stay in place if the bolt is removed to facilitate fixture and screw changes. The SNAPTOGGLE anchor meets Federal Specification FF-B-588-D for Type V anchors. The anchor consists of a corrosion-resistant zinc-plated steel anchor channel that inserts through a 1/2" drilled hole in walls, ceilings, or floors and installs against the back side of the mounting material; plastic straps attached to the channel that position it into place; and a plastic cap that slides down the straps and presses into the drilled hole firmly to lock the anchor channel in place behind the mounting material. Once the cap is set in place, the straps snap off by hand. The item being fastened affixes to the mounting material by inserting a bolt through the item, into the drilled hole, and through the anchoring channel behind the material and tightening. *Failure measured as breakage of drywall portion. The Toggle Wing Anchor is a four-piece fastener consisting of two matching "wings", each bent at two 90 deg angles. They also have an internally threaded nut with protrusions spaced 180 deg apart which serves as a pivot attaching the two wings. Finally, a wire spring provides the necessary tension to open and close the wings. Toggle Wing Anchors are light-duty anchors for use in hollow base material applications. They spread the load over a larger area and are more temperature resistant than other hollow wall anchors. Brand: Jet Fitting & Supply Corp. | Manufacturer: Jet Fitting & Supply Corp. The TOGGLER SNAPTOGGLE BCS toggle anchor provides a secure hold from within various hollow materials 3/8" to 2-1/2" thick including gypsum board, drywall, and concrete block, and is made in USA. The anchor requires a 3/8"-16 UNC-threaded metal bolt with a minimum length equal to the thickness of the item being fastened and the thickness of the mounting material plus 1/2". The anchor channel will not rotate when installing the bolt, whether installing by hand or with a screw gun, and will stay in place if the bolt is removed to facilitate fixture and screw changes. The SNAPTOGGLE anchor meets Federal Specification FF-B-588-D for Type V anchors. The anchor consists of a corrosion-resistant 304 stainless steel anchor channel that inserts through a 3/4" drilled hole in walls, ceilings, or floors and installs against the back side of the mounting material; plastic straps attached to the channel that position it into place; and a plastic cap that slides down the straps and presses into the drilled hole firmly to lock the anchor channel in place behind the mounting material. Once the cap is set in place, the straps snap off by hand. The item being fastened affixes to the mounting material by inserting a bolt through the item, into the drilled hole, and through the anchoring channel behind the material and tightening. Media Drill Diameter Bolt Description Ultimate Tensile Strength Ultimate Shear Strength 1/2" Drywall 3/4" 3/8"-16 UNC zinc-plated steel 275 lb. 292 lb. 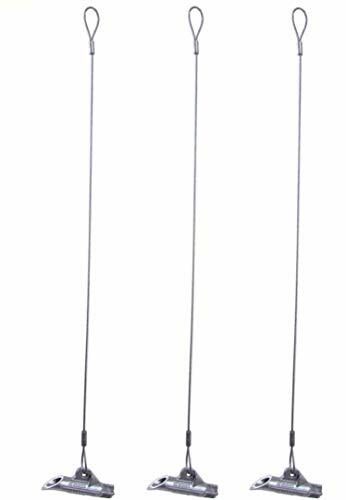 5/8" Drywall 3/4" 3/8"-16 UNC zinc-plated steel 576 lb. 406 lb. 1/2" Drywall with 25 Gauge Stud* 3/4" 3/8"-16 UNC zinc-plated steel 466 lb. Not available 5/8" Drywall with 25 Gauge Stud* 3/4" 3/8"-16 UNC zinc-plated steel 488 lb. Not available Concrete Block 3/4" 3/8"-16 UNC zinc-plated steel 1,745 lb. Not available *Failure measured as breakage of drywall portion. 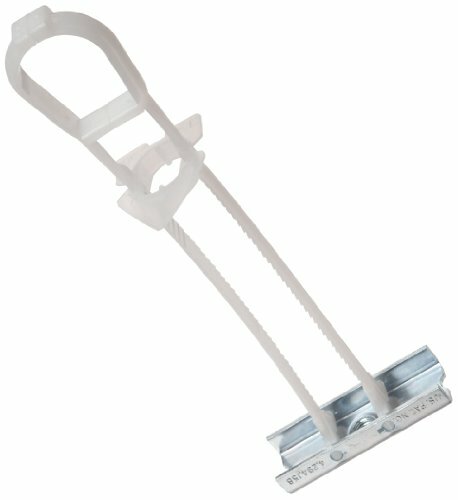 The TOGGLER SNAPTOGGLE BBS toggle anchor provides a secure hold from within various hollow materials 3/8" to 3-5/8" thick including gypsum board, drywall, and concrete block, and is made in USA. The anchor requires a 1/4"-20 UNC-threaded metal bolt with a minimum length equal to the thickness of the item being fastened and the thickness of the mounting material plus 1/2". The anchor channel will not rotate when installing the bolt, whether installing by hand or with a screw gun, and will stay in place if the bolt is removed to facilitate fixture and screw changes. The SNAPTOGGLE anchor meets Federal Specification FF-B-588-D for Type V anchors. The anchor consists of a corrosion-resistant 304 stainless steel anchor channel that inserts through a 1/2" drilled hole in walls, ceilings, or floors and installs against the back side of the mounting material; plastic straps attached to the channel that position it into place; and a plastic cap that slides down the straps and presses into the drilled hole firmly to lock the anchor channel in place behind the mounting material. Once the cap is set in place, the straps snap off by hand. The item being fastened affixes to the mounting material by inserting a bolt through the item, into the drilled hole, and through the anchoring channel behind the material and tightening. 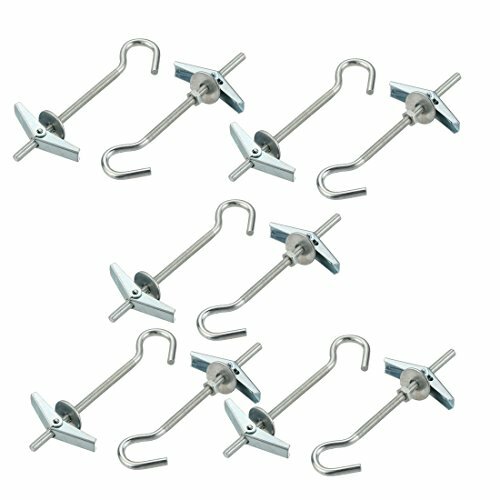 Toggle Anchor provides a secure hold in hollow-wall, plasterboard, cement board and wood board. 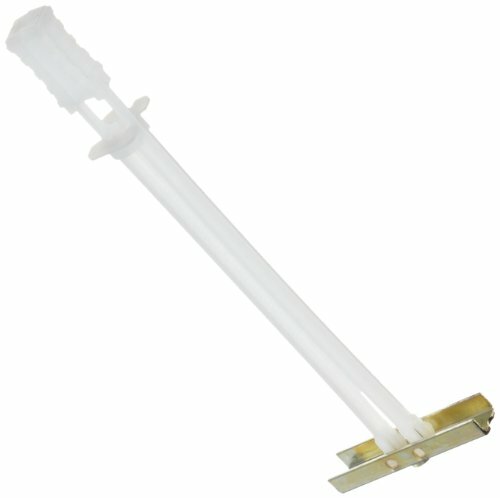 Ideal for attaching brackets, drywall track, lighting, electrical boxes or other light load object. Q235 Carbon Steel constructed with zinc plated finished, suitable for any acid and alkali environment. Pre-drilling a proper hole(12mm diameter), harmmer-driven the anchor and screw-in hook to expand and grip the mounting material. Quick, easy to installed and firm. Anchor down and secure your outdoor items firmly in the ground using the 68-DB1 Duckbill Earth Anchor. The 68-DB1 Earth Anchor works like a toggle bolt in the soil to secure many items to the ground that are prone to theft or being moved. You will need a hammer and a 68 Series Drive Steel Tool (sold separately) to drive the anchor into the ground with no holes, no concrete, and no digging required. Remove the drive tool and pull up on the cable to set the toggle. The upward pull rotates the Earth Anchor into a perpendicular lock position allowing it to firmly secure your item to the ground. Use it to secure and prevent the theft or unwanted movement of outdoor items, such as picnic tables, benches, BBQ grills, garbage cans, bicycles, swing sets, fountains, trees, construction equipment, and more. 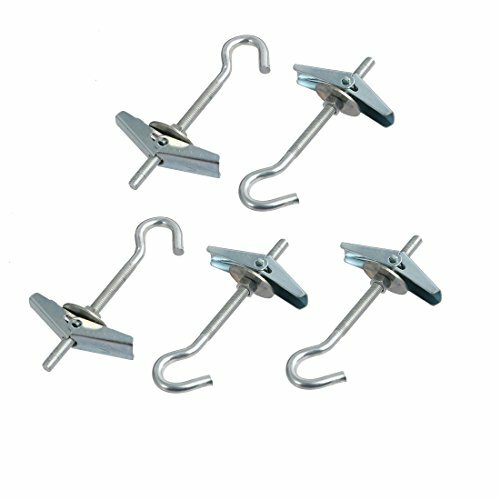 Toggle Anchor provides a secure hold in hollow-wall, plasterboard, cement board and wood board. 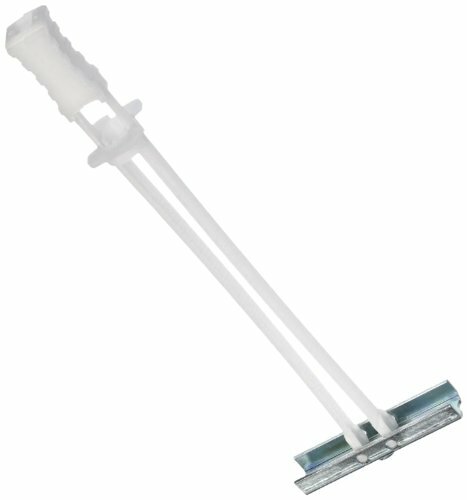 Ideal for attaching brackets, drywall track, lighting, electrical boxes or other light load object. Iron constructed with zinc plated finished, suitable for any acid and alkali environment. Pre-drilling a proper hole(11mm-12mm diameter), harmmer-driven the anchor and screw-in hook to expand and grip the mounting material. Quick, easy to installed and firm. 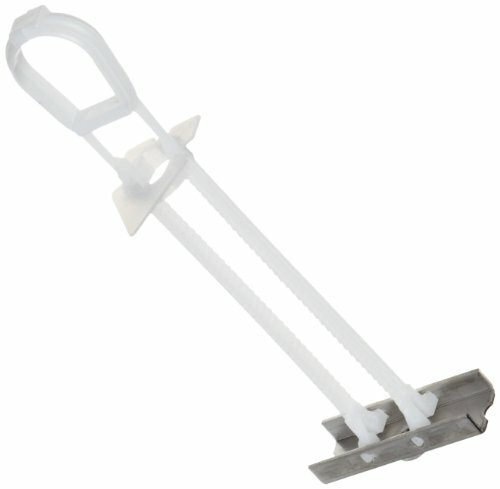 Toggle Anchor provides a secure hold in hollow-wall, plasterboard, cement board and wood board. 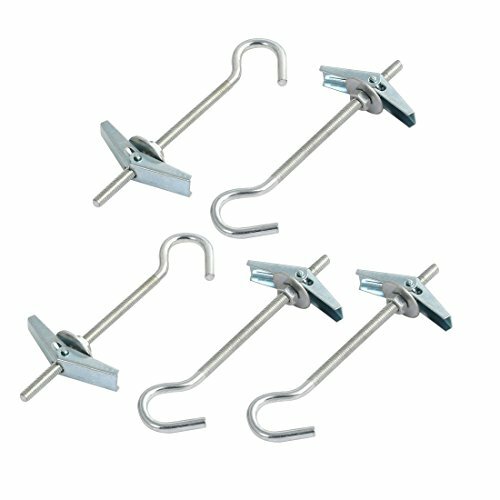 Ideal for attaching brackets, drywall track, lighting, electrical boxes or other light load object. Q235 Carbon Steel constructed with zinc plated finished, suitable for any acid and alkali environment. Pre-drilling a proper hole(16mm diameter), harmmer-driven the anchor and screw-in hook to expand and grip the mounting material. Quick, easy to installed and firm. 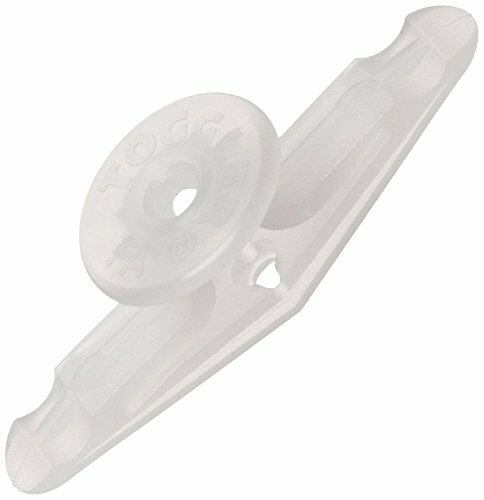 The TOGGLER SNAPTOGGLE BDS toggle anchor provides a secure hold from within various hollow materials 3/8" to 2-1/2" thick including gypsum board, drywall, and concrete block, and is made in USA. The anchor requires a 1/2"-13 UNC-threaded metal bolt with a minimum length equal to the thickness of the item being fastened and the thickness of the mounting material plus 1/2". The anchor channel will not rotate when installing the bolt, whether installing by hand or with a screw gun, and will stay in place if the bolt is removed to facilitate fixture and screw changes. The SNAPTOGGLE anchor meets Federal Specification FF-B-588-D for Type V anchors. 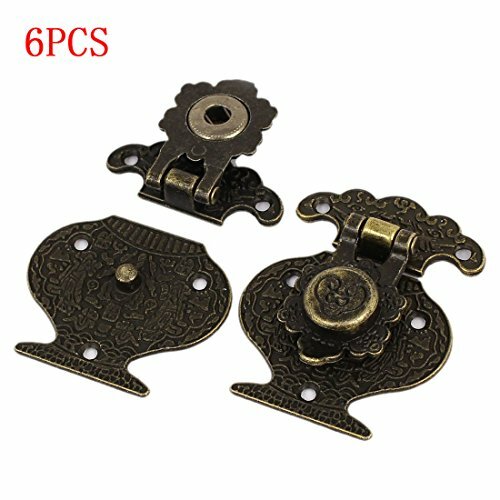 Latch with toggle closure is perfect for chests, boxes, trinket boxes and toolboxs. 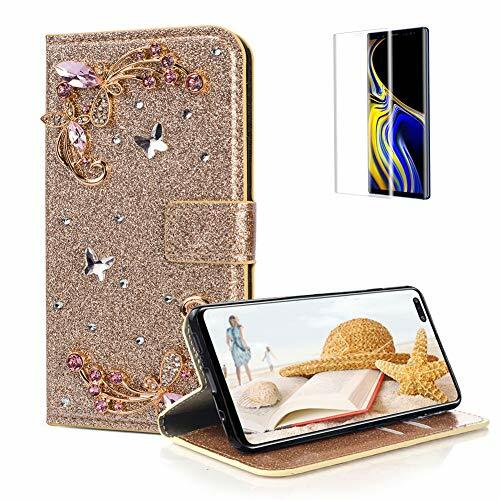 Featured with simple structure, easy installment, durability. Install parts are included here.  occasion The deresses is suitable for daily casual, beach, work, date, oustside, home, lounge, vacation, summer, spring, autumn.